Persistence pays, especially in the present times of social media. Everything and everybody, pretty much accessible. 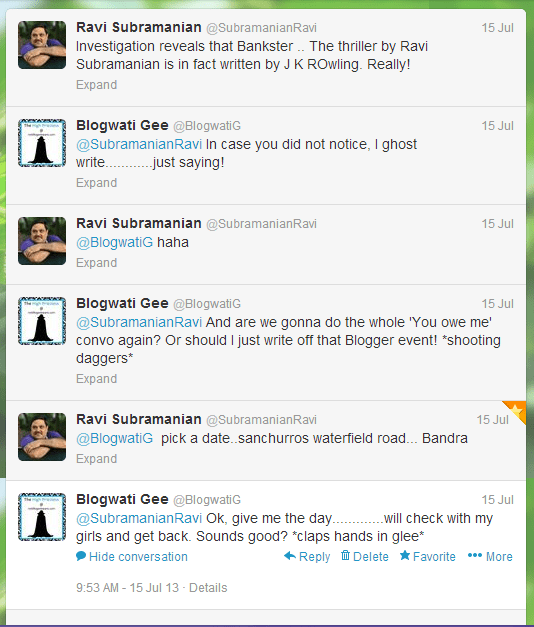 And so it was when an unsuspecting author randomly tweeted that he would like to have a blogger meet, someday. A follower, who was also a blogger, immediately gave a high five to the idea and said she looked forward to it. And then began a series of tweets. Every time the author said something, she reminded him of a promise forgotten. Until one fine day, out of fear of being online or sheer desperation of being stalked, god alone knows, but the author agreed. And thus the first ever OPEN BAR (Blogger Author Rendezvous) by the Indiblogeshwaris took place at Sanchurros Bandra, one rainy July afternoon. Ravi Subramanian, the celebrated author of The Bankster, among other titles, made our afternoon one to be remembered. He casually walked in, greeted one and all and then went on to have an informal meet with us. He answered all questions patiently and from experience. He spoke about his journey to becoming an author. He categorically attributed his success to his wife. Had she not gone out for a month and left him babysitting a four year old, then perhaps, the book would never be written, he quipped. If you have a book, get down to penning it, he said. The perfect moment is NOW. On being asked why Indian authors never made the literary cut, he made a very poignant point. Not every published western author makes it to the Indian shelves. Hence to say that we only produce ‘non-read worthy’ stuff is highly debatable. Talking about research for writing, he said that he tried to incorporate his travels into his books. That is how a CCD in Vienna became an important plot point in The Bankster. He was open to criticism, honest about writing and magnanimous about his contemporaries. As the afternoon graduated, the easy conversation clubbed with the fabulous eats had everyone wanting for more. Post customary pictures, we bid adieu to the man who not only made the time to connect but also played the generous host. Needless to say, Ravi Surbamanian had left a lasting impression on all of us. And so it was no surprise when we got an invite for the launch of his latest book, Bankerupt, we were going to be there. And Ravi being Ravi, he texted, then emailed and then called to confirm if we received the invitation. Little things do go a long way. And that is why he had bloggers who came from Airoli to Andheri for a launch in Kemps Corner. In Mumbai, that is huge, believe me! Well, the stage was set and it awaited its guests. A suave Ravi Subramanian walked in along with the very dapper Nagesh Kukunoor and Anish Chandy, Editor Penguin. They’d hardly settled saying their polite hellos when we heard a gunshot and a young boy seated right behind us fell to the ground. ACP Arjun and his team were to the rescue. They interrogated one and all, and no, the esteemed panel was not spared either. Finally, all of us were warned to comply with the security checking and if a copy of the Bankerupt was not found in our possession, leaving the store would not be a possibility. Needless to say, the act was applauded and we had our fourth guest of the evening, Shaleen Malhotra. An audio-visual set the tone of the book we held. Believe it or not, emus and environment seemed to occupy a place of pride along with education. Between conversations that ranged from an actor delivering his part in a story to a director’s vision of the script; an author not knowing what the character will do next to an editor wanting the storyline to be fluid, the panel and their panache was a hit. An interactive session was followed by the much awaited book signing. Also spotted in the esteemed list of guests were authors Prakash Iyer (Habit of Winning) and Upendra Namburi (31). It’s nice when the fraternity comes out in support, like this. Post our starstruck pictures, we headed home. And as we spoke animatedly about the evening, the one thing that resurfaced in the conversations was the simplicity of the man of the moment. He was in a comfort zone way ahead, with or without us. And it was this interaction with the audience that sets him apart from his contemporaries. Even as I write this, I got a call this morning thanking all of us for making it that far. He didn’t have to. And yet, he did. And what he has earned in the bargain are loyalists who will make an equal effort to read his work. So am I going to follow this up with a book review? You bet I am! Will it be unbiased? I know no other way that will please the author more. It was nice to be a part of this and Mr. Ravi’s personal invitation to all of us through you was indeed very sweet. Cherish it. Some day, you will use another name that begins with “R” and write a similar blog post. PS – Chetan’s youngest brother is called Rintu at home. hmmmmm…..quite interesting…. I have heard about his books but never got around to reading any!! Well, maybe you can and see if it works for you. I so missed this book launch! And also meeting the phamousss person we all know 🙂 Apart from all the others from BAR. Seems the book launch was an experience in itself..
Oh it was, Rohan. And why didn’t you two love birds show up? I believe more authors must connect to the audience directly. Ravi is one of the few. Based on the experience I had while reading Bankster, I am sure to pick this book. Deepa, you are bang on. He truly is a fab person, very down to earth. And believe me, after having seen people that have had nothing noteworthy to talk about, with their noses high up in the clouds, this one was a welcome change! I hate myself for not reading his book. Stuck between work and exams. HE SEEMS AMAZING and unless you do, I don’t think the readers will ever connect with you!! Don’t worry, I am sure you can catch the book when you are a tad bit easy on the pressure. And yes, he is amazing! There were so many personal touches by him during this whole process which makes one sit and take notice. I haven’t read any of his books yet but I will definitely pick one soon. « What if God was One of Us?